Mattel's Mars Explorer Barbie doll has launched on the first "one-doll" mission to Mars, in collaboration with NASA. A new collaboration between NASA and Mattel, the largest toy company in the world, is turning the Red Planet a tad more pink. "Mars Explorer Barbie," a new spacesuited version of the iconic fashion doll, officially launched on Monday (Aug. 5), to coincide with the first anniversary of NASA's Curiosity rover landing on Mars. Mars Explorer Barbie is packaged with a cardboard cutout of the six-wheeled Mars Science Laboratory, decked out in pink. "Adding to her resume of more than 130 careers, Mars Explorer Barbie doll inspires girls to be adventurous and to always reach for the stars!" Mattel stated. The Mars Explorer Barbie packaging art includes a list of facts about the history of U.S. female space explorers and promotes the space agency's Women@NASA website to learn more. The first Barbie astronaut outfit, "Barbie Miss Astronaut," was released in 1965, two years after Soviet cosmonaut Valentina Tereshkova became the world's first woman to fly into space and 18 years before an American woman, Sally Ride, would follow her. Inspired by the pressure suits worn by the all-male U.S. Mercury astronauts of the era, the Barbie Miss Astronaut (and matching "Ken Mr. Astronaut") spacesuits were silver with brown mittens and boots. Each outfit included a white helmet and an American flag for the dolls to carry. Mattel celebrated the 50 year anniversary of Barbie by re-releasing some of the dolls' most famous sets, including the Miss Astronaut outfit. "Yes, she was a rocket scientist, taking us to new fashion heights, while firmly placing her stilettos on the moon," Mattel wrote on the packaging for the 2009 "My Favorite Career" recreation. 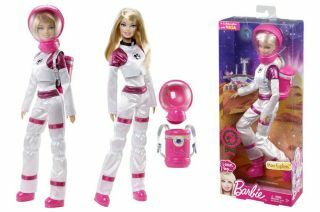 Twenty years after introducing Barbie Miss Astronaut, a new "Astronaut Barbie" was released featuring a pink and silver mini skirt-spacesuit "with sparkly skirt and tights." A 1985 television commercial described the doll in song. "You can be the first in outer space, fantastic fun in a far-out place. Then, for a change of pace, we know a spacey spot where this mini will look real hot!" Astronaut Barbie's accessories took a more realistic turn in 1994 in commemoration of the 25th anniversary of the first moon landing. "Includes authentic looking NASA helmet and spacesuit!" described the packaging for the "Special Edition" Career Collection doll, which was issued in time for Space Week. The toy set included glow-in-the-dark "moon rocks" and a stand featuring NASA's Apollo 11 anniversary emblem. In addition to her career as an astronaut, Barbie also went to U.S. Space Camp twice in a partnership between Mattel and the U.S. Space & Rocket Center in Huntsville, Ala.
First released in 1998, Space Camp Barbie was originally outfitted in an "astronaut blue" flight suit "like the ones worn by real astronauts." The doll came packaged with a NASA logo cap and miniature space food, space travelers checks and a Space Camp graduation certificate. A decade later, Mattel reissued Space Camp Barbie with a pink baby tee, white two-piece spacesuit and a mood star necklace (the shirt and necklace was also sold as life-size versions for Space Camp attendees to wear). The "Silver Label" edition was limited to 50,000 dolls. Mars Explorer Barbie is the second toy Mattel has timed with NASA's Mars Curiosity Rover mission milestones. In September 2012, a month after the car-size science laboratory landed on the Red Planet, Mattel released a Hot Wheels model of Curiosity. The 1:64 scale miniature was part of the toy company's assortment of 247 Hot Wheels cars for 2012. Prior to the Hot Wheels Curiosity set, Mattel worked with NASA's Jet Propulsion Laboratory, from where Curiosity is controlled, to release a series of five Hot Wheels Action Packs between 1997 and 1999. The toys included models of Mars rovers, Apollo spacecraft, planetary probes and the space shuttle. Click through to collectSPACE.com to see more photos of Mattel’s Mars Explorer Barbie and past Astronaut Barbie dolls.